Ancestral Lands of The Ese'Eja: The True People, The Latest Book by Jon Cox from Brilliant Graphics on Vimeo. At Brilliant, building lasting relationships is one of our most sincere pleasures. 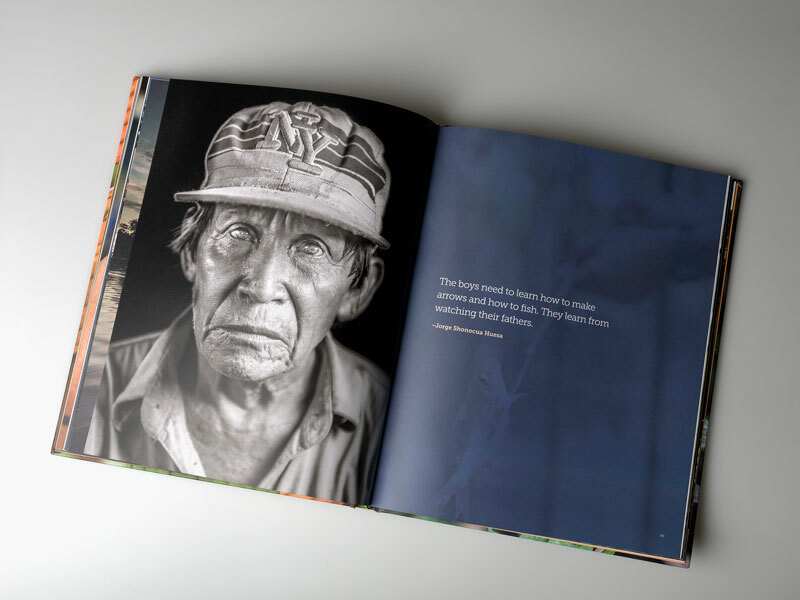 Our latest book, Ancestral Lands of the Ese’Eja was produced for long-time clients: photographer and National Geographic Explorer, Jon Cox, and designer, Phil Unetic. The project also introduced us to new client and photographer, Andrew Bale. Cox and Bale worked together to create intimate photographs of the Ese’Eja, and their photographs beautifully record the traditions of a rapidly changing culture. Collaboration fueled each and every stage of Ancestral Lands of the Ese’Eja’s creation. With Ancestral Lands of The Ese’Eja: The True People, Jon Cox and Andrew Bale tell the story of the Ese’Eja in their own voice—preserving the Ese’Eja’s ancient way of life through documentation. Funded by the National Geographic Society through its Genographic Legacy Fund, Cox began working with the Ese’Eja in March 2014. Through a process called “cultural mapping”, Cox’s and Bale’s stunning images and the supporting texts create a beautiful and complex portrait of the Ese’Eja—approved and guided first and foremost by the people. Ancestral Lands of The Ese’Eja: The True People. Brilliant: What is cultural mapping, and how does it affect your approach to photography? Jon Cox (JC): Cultural mapping is a process of collecting, recording, analyzing and synthesizing information in order to describe the cultural resources, networks, links and patterns of usage of a given community or group. When we’re working with indigenous communities on projects like this we are facilitating them telling the story of their people. We go in with an open mind and spend hours meeting with them as a community to make sure all objectives of the project are transparent from both sides. Once agreements are made and contracts signed we begin photographing to meet the goals set forth. At this point the community knows why we are there and are open to us taking images of their daily life, significant sites…. We also bring a small battery powered projector so we can host nighttime viewing to show community members what we are actually photographing. The photography was influenced by the goal to capture the collective voice of the community, the challenges they face and what’s important to them as a culture to share with future generations of Ese’Eja, locally and abroad. Brilliant: How did you ensure that the Ese’Eja’s voice is represented in your photographs? JC: We formed an editorial committee of elders that included all three Ese’Eja villages. We spent an entire week with the committee in Peru reviewing each and every page of the book to ensure that their collective vision was accurate. Brilliant: What were your goals for the design? Phil Unetic (PU): First of all let me say that this project was unlike any other that I have worked on in my entire career. Being able to visit and get to know the Ese’Eja in the Peruvian Amazon was an incredible experience and it changed the nature of my design thinking profoundly. It is very different in designing a book where you know almost each and every person in the photographs and you know their stories. The book has an overall narrative, traditional oral stories, multiple sidebar informative sections about daily life, beautiful photographs by Jon and Andy Bale, and the amazing black and white close up portraits of the Ese’Eja. All of these sections needed to be distinguished from each other with a goal to be harmonious at the same time. That is what I tried to accomplish with the design. The section opening page spreads go back and forth between a sweeping vista and up close photos and in some cases through the photographs you are seeing the world as the Ese’Eja see it. Also, you just can’t look at those life-sized black & white portraits without getting a real sense of the humanity we have in common with the Ese’Eja. They were a very important part of the book outside of the main narrative. Brilliant: Tell us a bit about your collaboration through the design process. JC: Phil and I have been working together since 2011 when he began designing my book Hadzabe, By the Light of a Million Fires which was also printed by Brilliant in 2012. Before design began on the Ese’Eja project Phil came down to Peru and spent over a week with us in the village of Palma Real to get a hands-on sense of what the Ese’Eja culture and environment. Working with Phil is such a wonderful process where we go through multiple iterations of the design. The first iteration is where we rough out the basic layout of text and Phil’s selections of photographs. This was taken to the editorial committee and full edits are made of both the text and images. Then Phil works his magic and makes the images and text come to life in a design that is easy to read and the message can be understood. I’ll let Phil elaborate. PU: Jon makes it sound like I just decided to go to Peru. In fact, he invited me to come with them to Peru with no real concrete goal in mind, but just to see how it might affect the design of the book. Working with someone with that kind of generous spirit is rare and infectious. Working with Jon and Andy was a great combination of serious crafting of ideas and complete joyful laughter. The book’s design took many passes between us and also back and forth to the Ese’Eja. I think I had the best ever cover design presentation meeting on the floor of the Ese’Eja community building with many of the Palma Real villagers. They were a pretty tough audience! 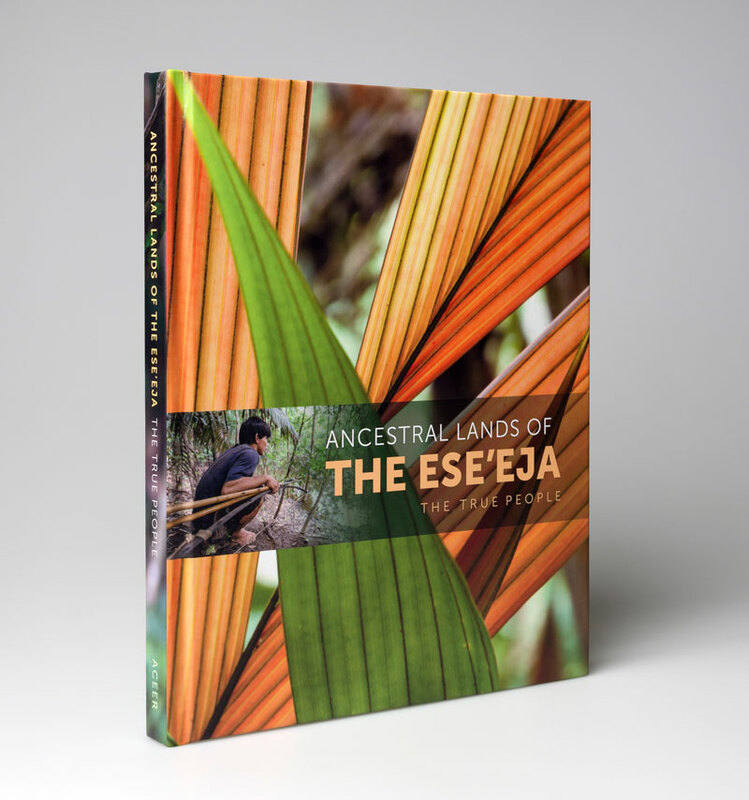 Brilliant: Ancestral Lands of The Ese’Eja: The True People follows a really unique structure for both a photography book. How did you develop the structure and design? JC: This book follows the idea of inside out anthropology where we are just there to listen and record the Ese’Eja telling their story without adding in our own preconceived ideas. 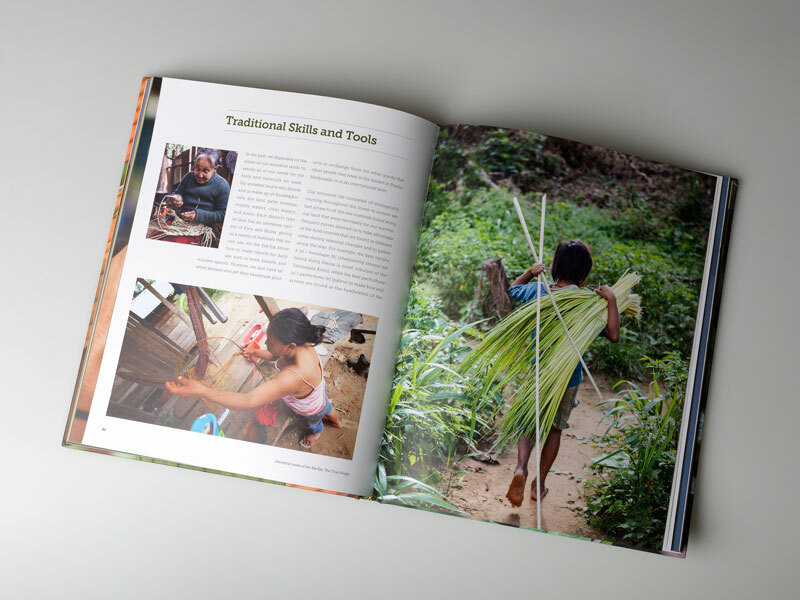 Our hope is that after reading the book people will walk away with a better appreciation of the indigenous knowledge of the Ese’Eja, their world view and conservation ethic. PU: You start out with an outline of the story you want to tell and then flesh out each section with photographs and text and keep going back to the initial outline to see if you are accomplishing those goals. Then there are just some drop dead great photographs or stories or quotes that don’t quite fit in the narrative but you add them in anyway and mix it around until it all makes sense again. Brilliant: What were your goals when sequencing the images? JC: The Ese’Eja believe they live in three worlds, the sky, the forest, and the water. We focused on those three areas and then documented their oral history and the current challenges they face so the reader would have a full picture of the Ese’Eja past, present and future. PU: And then design-wise you pace the images from large to small, close up to far away, adding contrast and pacing to the images on the pages. Most photos follow and support the narrative but some are added to intrigue or capture something off hand, or just make you see something from a different perspective. Brilliant: Why did you chose to work with Brilliant? JC: I started working with Brilliant when they were located outside of Exton, PA in a barn in Bob’s backyard. Brilliant’s attention to detail and ability to deliver much more than promised has always impressed me. From the conceptual design to holding the first book or print I have always felt like my projects are of the utmost importance to the staff at Brilliant. PU: Bob Tursack actually brought Jon and I together on the first book project about the Hadza people. I will say again as I have said before, unless someone makes me, I will not print with anyone but Brilliant. I have not worked with a printer in recent years with the craftsmanship and dedication that you get from Brilliant. And it is a true collaboration, the people at Brilliant see things that I don’t and make suggestions that go to improve the product. They also mean what they say and I have complete trust that they will get the job done the way it should be done. Brilliant: What was the best part of working with Brilliant? JC: Being on press and having the ability to make individual adjustments with Kevin to ensure the images come to life on the page. So much goes in to making a book that goes unnoticed to a reader. PU: All of the above! 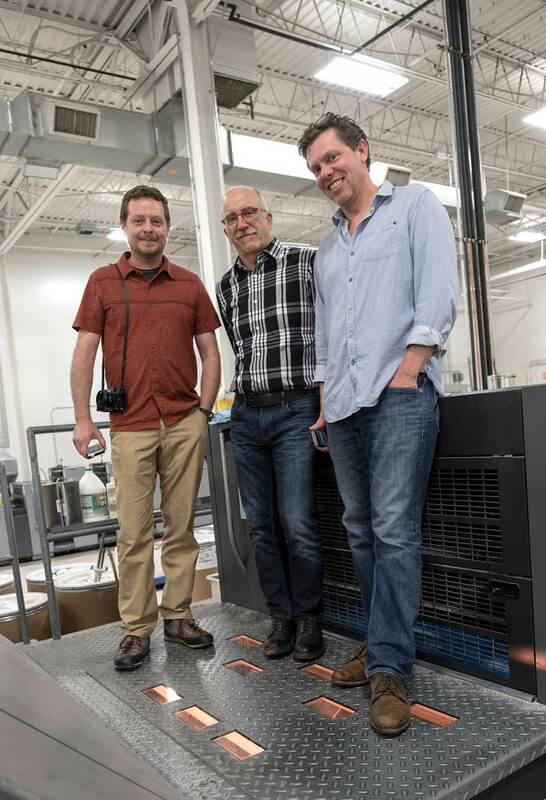 I love being on press at Brilliant, I love ink on paper, and I always hope they allow me to come back. So far so good. Brilliant: What are you working on next? PU: I don’t know that there is a book involved but I told Jon he has to take me with him. A corresponding exhibition featuring Platinum-Palladium prints and Mercury-Developed, Gold-Gilded Daguerreotypes by Andrew Bale and Jon Cox will travel across the United States through 2019. Visit Eseeja.org to learn more and purchase a copy of Ancestral Lands of The Ese’Eja: The True People. Proceeds from donations, book sales, and future exhibitions will provide funds that the Ese’Eja can use in support of community projects. Partner with Brilliant to bring your best work to life in print.